Product is 35% sliced organic daikon, 30% sliced organic taro, 20% thinly shaved organic burdock, 10% sliced organic carrots and 5% shredded shiitake mushrooms. This mixture of certified organic daikon, taro, burdock, carrots, and conventional shiitake mushroom has been conveniently pre-cut into pieces that are just the right size for adding to all sorts of soups. 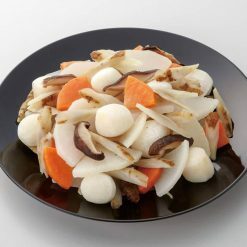 The daikon, taro, and carrots are sliced into attractive bite-size pieces, while the burdock comes shaved and the shiitake mushroom shredded to save you time. These five delicious ingredients are staples of many traditional Japanese dishes. Daikon is a type of radish and taro is a somewhat sweet root vegetable. Burdock roots are long and thin, and have been used in everything from teas to fried foods. 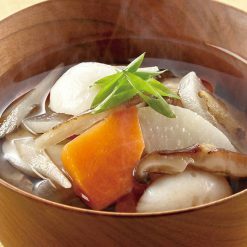 This combination of vegetables is extremely healthy, with daikon containing vitamin C and copper, taro containing vitamin E, potassium, and magnesium (as well as fiber), burdock and shiitake mushrooms containing antioxidants, and carrots containing potassium and vitamins A, K, and C.
Because the kenchin soup mix comes in easy-to-use ziplock bags, desired portions can be removed without needing to defrost the entire bag. Sugarlady’s vegetables are harvested in season and then frozen immediately in order to ensure the highest possible nutritional value and best flavor. Kenchin soup is a healthful soup associated with Buddhist temples. Though this vegetable mixture is labeled kenchin soup mix, the vegetables can be used in miso soup or pork soup as well as a variety of other traditional dishes. To make kenchin soup, first stir-fry the kenchin mix along with parboiled konnyaku (a gelatin-like substance made of a certain type of potato) in sesame oil, then add soup stock and heat, and lastly season with salt, soy sauce, or sake to taste, and add drained and crumbled tofu. This product contains organic daikon (sliced: 35%), organic taro (sliced: 30%), organic burdock (thinly shaved: 20%), organic carrots (sliced: 10%), shiitake mushrooms (shredded: 5%). Origin of ingredients: five types of vegetable (China). Prepared and packaged in China.